National Safety Stand-down - June 2 -6, 2014. As part of OSHA and the NRCA’s efforts to raise awareness among employees and workers about the hazards for falls, CentiMark will be featuring safety in our CentiMark Blog every day this week. During the Stand-down, employers and workers are asked to pause their workday to talk about fall prevention, ladder safety, scaffolding safety and roofing work safety. CentiMark is committed to safety for our crews and for our customers. Our goal is for our crewmembers to return home safely to their families every night after work. Safety and injury prevention are a huge responsibility for our full-time safety team. We review safety plans with our customers and crews prior to the start of all roofing projects. 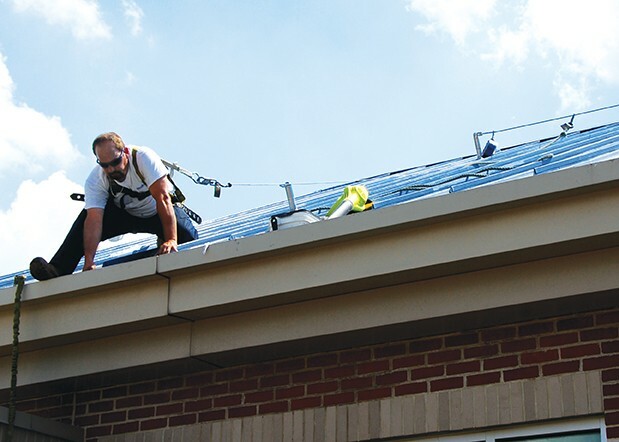 All roofing crews participate in a mandatory, written training program. Ongoing training and both scheduled and random job-site inspections are routine. Our goal is to meet and exceed OSHA (Occupational Safety and Health Administration) standards. Click Here to View Our Safety Resume! Company Safety Starts at the Top - Are Your Ladders Compliant? How Safe is Your Floor? Do you know?